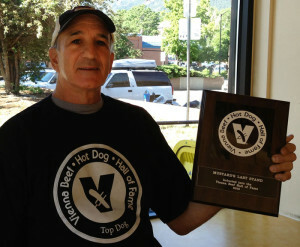 Making Doggone good food for 38 years! Want to learn all about the history of Mustard’s and how we got into the Vienna Beef Hall of Fame? You’re in the right place. Read on. Mustard’s Last Stand was founded in both Denver and Boulder in 1978 by Dan Polovin, a Chicago native who kept running into Chicagoland transplants who couldn’t find an honest-to-goodness Chicago-style hot dog to save their lives. In Chicago, the neighborhood hot dog stand is more than just a place to get the uniquely savory frank “dragged through the garden” and placed on a steamed poppy seed bun: it is a gathering place, a neighborhood nerve center whose signature Vienna Beef sign signals the good flavors and feelings of home. Every stand has its quirks and charms, and Mustard’s Last Stand is no different, putting a Colorado twist on the Chicago-style hot dog stand with a full menu of favorites and surprises. Whether your neighborhood is in Denver or Boulder, we’ve got a seat in our comfy spot for you and yours. Come by, have a bite and say hello! Watch this fun Fox News story about our 35th anniversary!